The new year is upon us, and with the continual rise in prominence of financial bloggers, Ticker Sense is pleased to introduce the first annual "Financial Blogger Outlook" survey. 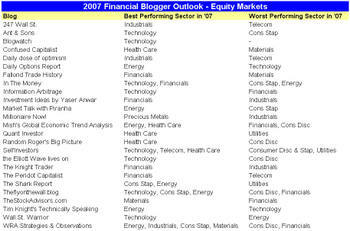 We polled 29 of the web's best financial bloggers on a multitude of topics to gain a consensus view on the markets in 2007. In a three-post series, we will highlight all of the answers to our poll questions and eventually conclude with a spreadsheet that lists each blogger with all of their opinions. For the first part of our survey, we focus on consensus equity market views. Below is a table listing 2007 year-end S&P 500, DJIA, and Nasdaq price targets from each of our participants. As shown, the averages forecast a change of 2.39% for the S&P 500, 2.20% for the Dow, and 3.47% for the Nasdaq. 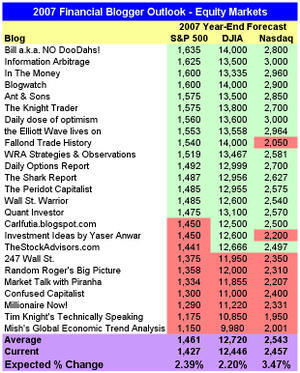 The most bullish blogger on the S&P 500 is Bill a.k.a. NO DooDahs followed closely by Information Arbitrage. The most bearish is TraderTim and Mish's Global Economic Analysis. When asked about specific sector performance in '07, bloggers clearly favored technology, energy, and health care and opposed consumer discretionary, utilities, and telecom. We also asked financial bloggers whether large cap or small caps would outperform in '07 and if growth or value stocks were more attractive. 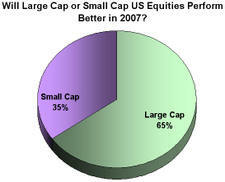 From our poll results, large cap growth is favored the most. 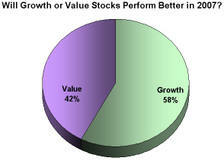 In the next part of our Outlook, we will take a look at individual stock picks. Please take a look at the investment strategy paper on www.copstrat.com. I am very interested in your opinion. Nothing for sale on this site -- just an investment research paper and the results of a research model that ran 15 years of monthly data on asset classes. Detailed Technical analysis on Wal-Mart and how to trade it in short term. most two-thirds of children want their parents to spend more time reading to them before bed, and most prefer Mum's storytelling to Dad's, researchers said.